Comes to play SWF file on BlackBerry, Archos, Creative Zen, iRiver, PSP, PS3, Xbox, Wii with 4Easysoft SWF to AVI Converter. This SWF AVI Converter takes the technology to convert SWF to AVI format, and HD AVI, DivX HD (.avi), XviD HD (.avi) with speed and precision. 4Easysoft SWF to AVI Converter possesses a variety of video editing features such as adjusting video effect, trimming excellent video clip, inserting interesting image or text as watermark, cropping video to cut off the undesired black edges. Possessing this SWF to AVI Converter, you will have a wonderful and extensive digital entertainment life! 4Easysoft SWF to AVI Converter can output your SWF video to BlackBerry, Archos, Creative Zen, iRiver, PSP, PS3, Xbox, Wii. Loading SWF files and setting AVI and other different formats as outputs simultaneously is possible. 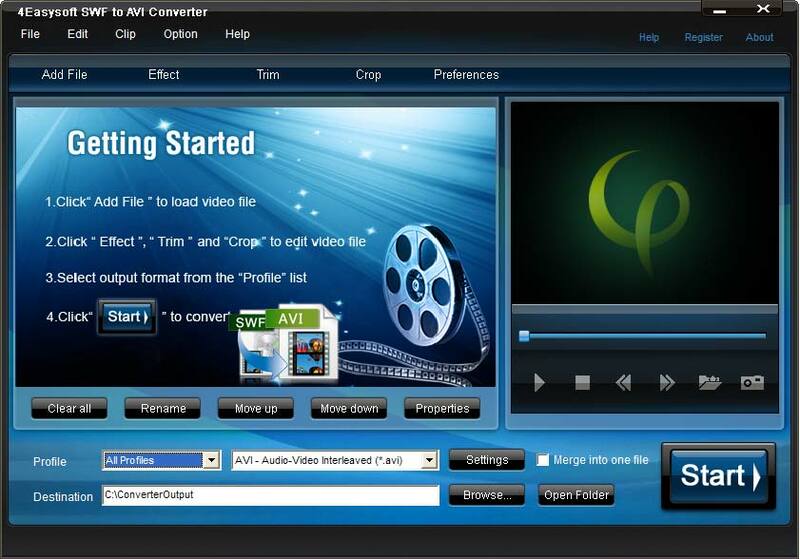 4Easysoft SWF to AVI Converter allows you to set the video Brightness, Contrast, Saturation. Checking Deinterlacing helps you to convert interlaced video to the progressive video, this function can optimize the video effect. 4Easysoft SWF to AVI Converter doubles your enjoyment with joining several interesting clips into one. Crop frame size to remove your unwanted area using SWF to AVI Converter like the smart scissors. Customize your video by adding picture or text watermark and adjust its position to your own preference. Choose your want audio track and subtitle according to your preference. With professional video encoding and decoding technique, 4Easysoft SWF to AVI Converter brings you the advanced and high speed converting process. On the other hand, this SWF to AVI Converter has the magic charm to impress users with best video quality. Give the chance to add watermark for your video. Own the way to select audio track and subtitle. Have the capability to output different format files at the same time.